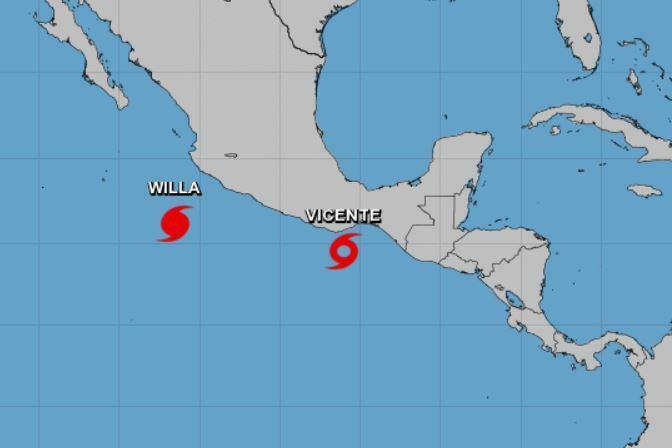 Hurricane Willa is gaining strength and forecast to impact Mexcio later this week but Tropical Storm Vicente is weakening in the Pacific region, the National Hurricane Center said Sunday. Willa is expected to become a major hurricane by Monday morning with rapid strengthening, the NHC said. The storm was about 250 miles south-southwest of Cabo Corrientes, Mexico, with maximum sustained winds of 115 mph and was moving north-northwest at 6 mph, the NHC said in a Sunday evening advisory. Hurricane-force winds extend outward up to 25 miles and tropical storm-form winds are outward up to 80 miles. The government of Mexico has issued a hurricane watch for the coast of Mexico from San Blas northward to Mazatlan, and a tropical storm warning from Playa Perula northward to south of San Blas. A tropical storm watch was also issued from north of Mazatlan to Bahia Tempehuaya. By late Sunday and Monday, a turn toward the north-northwest is forecast. Willa is expected to accelerate toward the north-northeast and approach the southwesterncoast of mainland Mexico by late Tuesday. The other storm, Vicente, is forecast to weaken Monday and Tuesday. It will remain just offshore or near the southern coast of Mexico through Monday, the NHC said. Vicente was about 230 miles south-southeast of Acapulco, Mexico, with maximum sustained winds of 40 mph and was moving at 10 mph, the National Hurricane Center said in its 5 p.m. ET advisory. Tropical-storm-force winds extended outward up to 35 miles. With Willa and Vicente, the 2018 Northeast Pacific hurricane season has hit a record for the most seasonal Accumulated Cyclone Energy, Meteorologist at Colorado State University Philip Klotzbach said in a Twitter post.